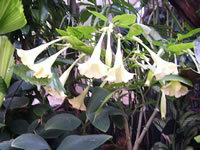 Angel's Trumpet's or Brugmansias are vigorous, easy to grow sub-tropical shrubs from Central and South America. In frost free areas where they are hardy, Brugmansia plants can grow from 6-12 feet tall, depending on the species. From early summer until fall, mature Angel's Trumpet's produce waves of large, very fragrant, downward hanging, trumpet shaped, 6"-10" long flowers. In frost free regions, they may bloom all year long. 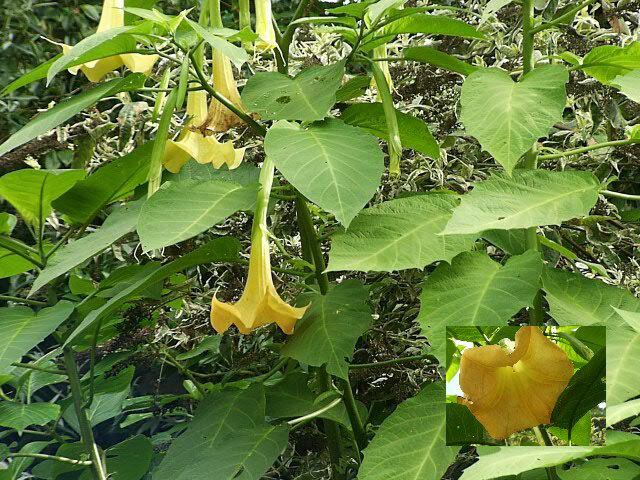 All parts of the Brugmansia plant are extremely poisonous if ingested! If you are growing your Angel's Trumpets in the garden, they should be planted in a sheltered area in light, fertile, well-drained soil. In most areas, they will grow and flower best in full sun, but in hot, dry climates they will appreciate light shade or mottled sunlight, especially during hot, mid-day sun. A heavy layer of mulch will help to keep the roots cool and help to preserve moisture. Brugmansia plants need a lot of water when they are actively growing, or they may quickly show signs of stress like wilting or pale foliage, and they may become susceptible to attacks from spider mites or whiteflies. New growth should be protected from snails and slugs. Feed monthly from spring until early fall, using a good, all-purpose fertilizer. Brugmansias are only hardy in USDA zones 9-12. In colder regions, plants that are grown in the ground must be dug up in early fall, before the first frost. Keep as much soil around the roots as possible. Store them in a cool (50°) area, and keep them fairly dry through the winter. gradually increasing the exposure to sun and wind over the next week or two. Brugmansias grow and bloom easily in large (minimum 12"-15") planters, but they may not produce as many flowers as if they are planted in the ground. They should be planted in a good, commercial potting mix. In cold winter areas, the planter should be brought back indoors during the fall and winter months. While indoors, some people choose to continue growing their Angel's Trumpets as a foliage house plant by keeping it in a warm, sunny location and continuing to water it as the soil dries out. Don't expect your Brugmansia to bloom while it is in the house, though. A few weeks before you can move your Brugmansias back outdoors, you can start to bring it out of dormancy by repotting it if necessary and moving it into a warm area with bright light, and increased watering. This is a good time to prune your Brug, to encourage bushy growth or limit size. Do not move your Brugmansia back outdoors until night time temperatures will remain above 50°. Allow it to acclimatize to outdoor living by gradually increasing the amount of sun and wind exposure it receives. Container grown Brugmansias need a lot of water and may need to be watered daily, especially in warm weather. Feed every 2-3 weeks with an all-purpose fertilizer while actively growing or in bloom. Brugmansia plants bloom on new wood so they can be pruned anytime you want to shape but it takes about a month or more for blooms to appear after pruning, so most growers choose to prune them very early in the spring. 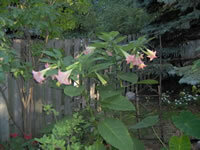 Brugmansias can withstand hard pruning and can even be cut back to within a foot of the base if desired. Primary pruning involves cutting back any older branches to ½" above a node. This will encourage additional branching. Light trimming of older growth throughout the growing season will encourage additional blooms. The fastest and perhaps the easiest method of propagating new Brugmansia plants is with softwood tip cuttings taken in the spring or summer. Be sure to keep the correct end of the cutting pointing 'up'! Once the cutting has a good strong root structure, it can be gradually moved into the garden or it can be planted in an 8" pot, and moved into full sun. Allow the plant to become rootbound before replanting in a 12" or larger planter. Multiple plants can be started from a single cutting by a method known as Log Cuttings. This is a good way to recycle plant parts that were discarded while pruning! Cut portions of the stem into 5"-8" segments containing at least 3or 4 nodes. Dust the cutting lightly with a rooting hormone. With the majority of nodes facing upwards, press the cutting into the surface of moistened, commercial potting mix or a mixture of peat moss and vermiculite, mounding the mix half way up each side of the cutting. Create a mini-greenhouse with a frame of cut wire coat hangers and clear plastic over the cutting bed to increase humidity and to keep the soil from drying out. Keep your cuttings at a minimum temperature of 72°F. After several shoots have grown to a couple inches tall, you can separate the individual plants, using a sharp, sterile knife. Home harvested Brugmansia seeds are covered with a thin, pulpy coat that must be removed prior to planting. The peeling is easy to remove when the seeds are fresh, but you may have to soak older seeds for a while to get the skin off. Brugmansia seeds require light for germination, so just barely press them into the surface of the growing medium. Sow Brug seeds indoors in early spring. Maintain a temperature in the growing medium of 60°-70° until germination, which takes 3-4 weeks. Do not move seedlings outdoors until night temperatures are above 50°. Seed grown Brugmansias will not bloom until their second season.